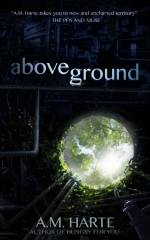 This short story is set several years before the events in Above Ground. It provides insight into the WPL (Witches’ Protection League) and marks a turning point in WPL’s policies, from passive anti-werekin attitudes to the aggressive tactics seen in Above Ground. Evelyn was a short woman, petite and blonde, seemingly innocent in appearance. She was also a woman who knew how to charm. She stood idly by the doorway, hardly betraying her inner turmoil. In front of her, slowly coming to his senses, was a werewolf. The floor was covered with a murky carpet that matched her feelings inside. He was sprawled on it, one hand still stained with blood, a flash of colour in the near darkness. He noticed the blood on his fingers, brought it up to his nose. “Then what…?” He paused, unable to resist the impulse to lick off some of the blood. The sight nearly killed her. Evelyn allowed herself a brief daydream: striding across the room, slapping his face, shoving his nose into the pool of blood behind him. When he looked up at her, she shrugged, striving to make the movement look casual. He turned around, then let out a hoarse pain-filled cry. He scrambled away from the small body, on his hands and knees like the animal he was, and knocked over a vase filled with fresh, red roses. The petals scattered. “How else could you stand there, looking so calm?” In his anger, his fingertips changed back to claws. He didn’t seem to notice. He reached out, touching a cheek tenderly and brushing away the tangles of hair that covered the two year olds’ face. Glassy emerald eyes stared at the ceiling, small lips curved downwards in a frozen frown. His body shuddered with suppressed grief as he turned to pick up a rose from where it lay on the floor, amongst the scattered bits of glass. He placed it beside the young girl’s cheek. The rose had already begun to wither. 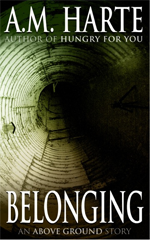 Evelyn pulled out the gun she’d been hiding behind her back and levelled it at his body. She didn’t give him any warning. His body shuddered from the impact and fell backward. She released a whoosh of breath, let her arm drop to her side. It was over. Someone coughed politely behind her. Evelyn jumped and whirled around, bringing the gun up again. It was the witch who worked on reception at the W.A.W. headquarters, a self-important and overweight man. She lowered the gun. “What is it?” she snapped. He looked startled. Reminding herself of the importance of networking, Evelyn forced a smile and apologized, then asked the question again. Evelyn gave herself one second to process the news. Then, with a grave, sympathetic smile, she reached out and touched the man’s arm. “Very well. I’ll be with you in a moment.” She squeezed his arm reassuringly, letting her fingertips trail across his hand as she pulled away. He smiled back almost giddily. His eyes slid past her, into the room, but he said nothing. He bowed deeply and strode down the corridor. Evelyn was a short woman, but mostly a woman who knew how to charm. She stood idly by the doorway with a smirk on her face, hardly betraying her inner turmoil. At her feet, drawing his last, gasping breaths, was a werewolf.